As one of the larger 3-row crossovers on the market, the 2018 Volkswagen Atlas has a spacious interior that’s comfortable for passengers and offers plenty of cargo space. Exactly how big is the interior? Drivers in Lee Summit, North Town, Overland Park, Mission, and Olathe can discover the passenger space and cargo volume of this impressive crossover with this 2018 Volkswagen Atlas interior dimensions review by Volkswagen Lee’s Summit. When it comes to crossovers, nothing is more important than the comfort and convenience of the driver and passengers. The VW Atlas has excellent passenger space in all three rows, so all seven passengers can stretch out and relax. 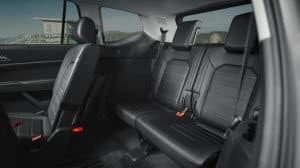 With the optional second-row captain’s chairs upgrade, however, the passenger capacity drops down to six, though that does offer a little more interior walkthrough space than the standard second-row bench seat. In the front row, passengers enjoy 41.3 inches of headroom, 41.5 inches of legroom, 61.5 inches of shoulder room, and 58.2 inches of hip room. In the second row, passengers have 40.4 inches of headroom, 37.6 inches of legroom, 60.8 inches of shoulder room, and 58 inches of hip room. This is slightly less than the front, but still accommodates tall passengers, even on longer car rides. The VW Atlas even offers third-row passengers adequate space to be comfortable, providing 38.3 inches of headroom, 54.9 inches of shoulder room, 45.1 inches of hip room, and 33.7 inches of legroom. With all the seats upright, the massive cargo bay of the VW Atlas offers 20.6 cubic feet of space, which is enough for luggage and shopping bags. With the third row folded, this area expands to 55.5 cubic feet, and with all three rows folded, the total cargo capacity is 96.8 cubic feet. With that much space, there’s virtually nothing you can’t haul in the back of your VW Atlas. The second-row seats also push forward easily to configure the space for awkward cargo, as well as to access the third row. The tip-forward split-folding seats can be tipped forward or adjusted without removing a child’s seat, which is a huge benefit for families with young children. A power liftgate is also available for more convenient cargo loading and unloading. With so much space, it’s no surprise that the 2018 Volkswagen Atlas is touted as one of the best family-oriented, 3-row crossover SUVs on the market. There’s ample space for passengers, excellent cargo capacity, and a variety of options for versatility and convenience. Drivers in Lee Summit, North Town, Overland Park, Mission, and Olathe can see the interior dimensions of the 2018 Volkswagen Atlas when they visit Volkswagen Lee’s Summit. Contact us or stop by today to schedule your test drive!